Water-resistant sunscreens are essential when your outdoor activities involve swimming or perspiring heavily because they are formulated to stay on skin when you get wet. BUT, “water-resistant” doesn’t mean “waterproof”—you must REAPPLY to keep your skin protected! Also, how you apply water-resistant sunscreen in the first place is critical to protecting your skin from damage, premature aging, sunburn, and skin cancer (which is far more prevalent than people think). Our goal is to make sure you safely have fun in the sun. “Water-resistant” does not mean “waterproof,” which is why waterproof claims are no longer allowed to appear on any sunscreen products per the latest FDA regulations. “Sweat proof” is also an illegal claim, and a product with that claim should absolutely not be trusted. Sweat will break down water-resistant sunscreens. Water-resistant sunscreens last only 40 to 80 minutes after your skin becomes wet. That should be clearly stated on the label; if it isn’t, don’t buy it. We know this is disappointing news (we wish they lasted longer, too), but it’s just the simple truth, and that’s what matters. Like any sunscreen, the key application tip is to apply liberally. Apply a visible layer over the areas that will be exposed to the sun and then evenly massage it into your skin. Apply any sunscreen, but especially water-resistant sunscreen, at least 15 minutes before heading outside. We can’t stress this enough: Do not wait to apply until you get to the beach or the pool or start exercising outside. If you’re not sure you’ve applied enough, add another layer, especially to the back of your neck, tops of hands and arms, shoulders, and the tops of your feet—all of these areas are prone to either being missed or under-applying, resulting in sunburn. Another fact that may be hard to accept, but that we strongly recommend you take to heart, is: As important as water-resistant sunscreen is, it is not enough by itself because you can’t really adequately cover your body if you’re wearing a bathing suit (especially a skimpy one) or skin-revealing workout clothes. For enhanced protection, you’ll need UV-protective clothing, hats, and sunglasses to shield your eyes (and the skin around them) from damaging UV light and sun-reflective surfaces, such as sand, water, and snow. 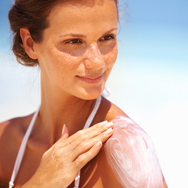 Another challenging aspect of sun protection is how often to reapply. You need to reapply water-resistant sunscreen after perspiring or swimming for 40 to 80 minutes, depending on what the label says. It’s important to follow the application instructions on water-resistant sunscreens exactly. Making a mistake here is cheating your skin, unintentionally allowing unwanted damage. Even if you’re not sweating or submerged in water for more than 40 minutes, you must reapply any water-resistant sunscreen after toweling off, as towel-drying always removes some amount of protection. When in doubt, it’s better to reapply than to wait and see what happens if you don’t! Many people wonder if there’s anything special they need to do to remove a water-resistant sunscreen. The answer is no—this type of sunscreen should come off easily with your daily cleansing routine. Your gentle facial or body cleanser and, ironically, water is all it takes to remove it (remember this is water-resistant sunscreen, not waterproof). It absolutely isn’t necessary to scrub sunscreens (even water-resistant sunscreens) off skin, especially with body scrubs that contain sugar, salt, or ground-up nuts and shells, all of which can aggravate and hurt skin. What is the Best Water-Resistant Sunscreen? We like to say the best water-resistant sunscreen is the one you look forward to applying! The formula should feel silky-smooth, blend easily, and set to a non-greasy finish that doesn’t make skin feel coated. • Look for a water-resistant sunscreen rated SPF 30 or greater. • Make sure your water-resistant sunscreen is labeled “broad spectrum,” which means it protects your skin from both UVA (aging rays) and UVB (burning rays) light. • Opt for water-resistant sunscreens that contain antioxidants for enhanced environmental protection. Examples include green tea, soy, grape, all forms of vitamin C, and vitamin E.
• Avoid spray-on sunscreens that contain high amounts of denatured alcohol, as this type of alcohol can sensitize skin and make it feel dry. • Alcohol-free, spray-on water-resistant sunscreens are great for protecting hard-to-reach areas on your back. The trick is to be sure you aren’t just spraying the air, but instead getting all the sunscreen on your skin. • The “wet skin” type of water-resistant sunscreens can be helpful for reapplying when toweling off isn’t a convenient option. Such formulas can be applied and reapplied when skin is wet, which can be especially helpful when putting sunscreen on squirming kids!